Description: The DAARC program is designed to improve the recognition of an anticipated emergent airway and the early identification of a cannot intubate, cannot ventilate situation. The focus of the training is to manage difficult airways using the Vortex Approach and implement the scalpel, spreader, and bougie open surgical cricothyrotomy technique. The Vortex approach is a cognitive aid to be used when making decisions while in a high risk and high stress difficult airway management situation. Identify which Emergency Cricothyrotomy Catheter kits or instruments available at their facility. Assess rapidly the patient with an Unanticipated Difficult Airway. Identify the anticipated emergent airway where the patient’s ability to maintain their airway deteriorates rapidly. To the extent, the majority of patients lose the ability to maintain their own airway. Achieve an acceptable performance level for Difficult Airway Management temporal decision making in various critical emergency difficult airway situations. Demonstrate Difficult Airway Management temporal decision-making skills in time-limited activities with death a possible outcome. Describe three different surgical techniques for gaining airway access. The Melker Percutaneous Bougie technique, the Scalpel Spreader Bougie technique, and the Cric-Control System. Apply three different surgical techniques for gaining airway access. Use a Melker Percutaneous Cricothyrotomy technique during Advanced Cardiac Life Support (ACLS). Use a Melker Percutaneous Cricothyrotomy technique during emergent failed airways. Use a Scalpel Spreader Bougie Open Surgical Technique during emergent failed airways. Use a Cric-Control System Open Surgical Technique during emergent failed airways. Introduce an 18-gauge needle through the cricothyroid membrane. Aspirate free air to confirm location of needle tip in trachea. Advance the guidewire through the 18- gauge needle followed by removal of the needle leaving the guidewire in place and advance a dilator-airway catheter assembly over the guidewire. Inflate the catheter cuff and confirm catheter placement with end tidal CO2 during ventilation. 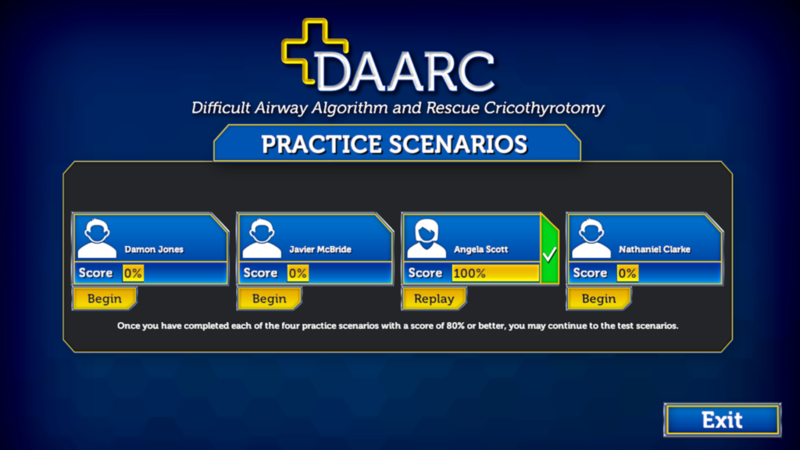 Goal or Challenge: The Difficult Airway Algorithm and Rescue Cricothyrotomy (DAARC) game was designed, developed, tested and delivered as an educational training application to ensure that VA Healthcare Providers and staff personnel are adequately trained in Difficult Airway Algorithm and Rescue Cricothyrotomy (DAARC) designed to help reduce patient morbidity and mortality associated with difficult and lost airways. The instructional cognitive, affective, and psychomotor focus is on the time-based critical clinical decision making related to a difficult airway management algorithm (Vortex) and the placement of a percutaneous cricothyrotomy catheter. Primary Audience: Anesthesiologists, Emergency Medicine Physicians, Critical Care Physicians, Otolaryngologists, and nurses.